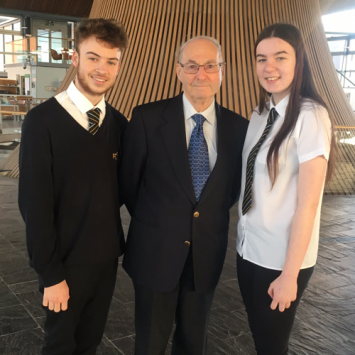 On the 23rd January, Seren and I, spoke at the Holocaust Memorial Day event at the Senedd, organised by Julie Morgan AM, about the Holocaust Educational Trust’s Lessons from Auschwitz project – a scheme in which participants meet a Holocaust survivor and visit Auschwitz itself. We reflected on hearing Eva Clarke’s testimony, as well as our visit to Auschiwtz-Birkenau. Eva Clarke was born at Mauthasuen Concentration Camp, days before liberation in April 1945. At Eva’s birth, her mother weighed just 5 stone, due to the starvation the prisoners were forced to endure. After giving such a bleak and disturbing testimony, Seren and I found it incredible that Eva harboured no hatred or desire for vengeance, preaching only love and acceptance for the world. 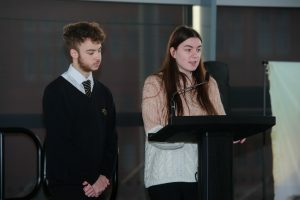 At the Senedd, I spoke of our experience in visiting Auschwitz-Birkenau, with Eva’s story in the forefront of my mind. We walked throughh the gas chambers and crematoria – an unreal experience in a place of such atrocities. I had to mention the sub-zero temperatures we were faced with while in Poland. Wrapped in layers upon layers, we were all amazed at how anyone could endure the cold, with no shoes and the thin clothing the prisoners were given. It served as a reminder and testament to the resilience of the human spirit. I also talked about the dangers of becoming desensitised to the horrors of The Holocaust. Citing the ‘6 million’ figure, the approximate number of Jewish people killed in The Holocaust, I stressed the importance of remembering each victim as an individual, not merely as part of a statistic. I referenced the gallery set up at Birkenau, a collage of hundreds of family photos. These photographs serve as an attempt to re-humanise the 6 million. Seren then spoke about how we spread the message to our community, including school displays and lessons. Seren also focussed on the Holocaust Memorial Day’s theme – ‘Torn from Home’. Victims of The Holocaust were forced from their homes and taken to concentration camps or ghettos. In the museums at Auschwitz, a display showed a group of keys, taken from victims on their entrance to the camp. They arrived with the hope that one day they would return home; 6 million didn’t. 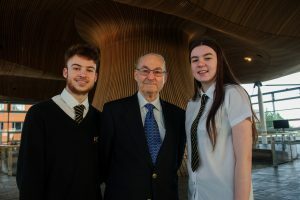 After giving our speech, we welcomed Henri Obstfeld, a Holocaust survivor, who gave us a moving testimony of growing up in Nazi occupied Netherlands, how he had to live in hiding with foster parents and hide from the German occupiers. He and his parents miraculously survived, but many didn’t. During the event, there was a performance by Tom McCarthy, a folk singer and Irish Traveller, and there was also a mixed-media installation, incorporating the voices of Gypsies and Travellers from across Wales. The event was a poignant way to commemorate the lives of all the victims of The Holocaust.